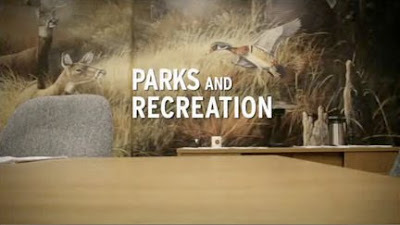 Back of the Head: Parks and Recreation 2x14 - "Leslie's House"
Parks and Recreation 2x14 - "Leslie's House"
I never realized we'd never seen Leslie's house until this episode. For some reason, when she was planning her dinner party, I just assumed it would take place in Ann's house. I miss Officer Dave, but Justin was a really good choice of a character 180 degrees from Dave as a Leslie love interest. I also loved the Leslie logic of getting a government form that proves her party was a success. And the metaphor of Justin being a white stallion and Tom being a little brown pony. And Ron pressuring Leslie into five courses and then bringing deviled eggs. You know who would have been a really interesting party guest? Councilman Dexhart. The Office 6x13 - "The Banker"
Community 1x14 - "Interpretive Dance"
Parks and Recreation 2x13 - "The Set Up"
Community 1x13 - "Investigative Journalism"